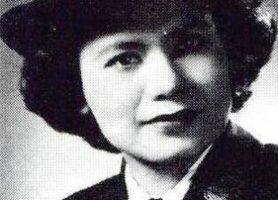 During World War II, this woman quietly undermined Japan's occupation of the Philippines, and was tortured for it. Then she quietly raised a family in the United States. When a cruel dictator ruined this Dominican Republic family, these sisters gave their lives to end his. Once upon a time, there was a lesbian Wild West abortion doctor. She once horsewhipped a guy in the face and was tossed in San Quentin Prison for sedition. To the surprise of no one, she lived in Portland. Destined to be a mere political pawn, this Mongol queen rode into battle while pregnant, united the warring tribes, and was considered to be the second coming of Genghis Khan. When a neighboring tribe threatened the Yoruba, this queen went undercover as a spy to find their weakness. Chicago detective whose crime-busting exploits grew so popular she had her own newspaper series and starred in her own movie. The daughter of an aboriginal woman and a white man, her race led her to be kidnapped by the Australian government - only for her to escape and walk across the continent to get home... twice.